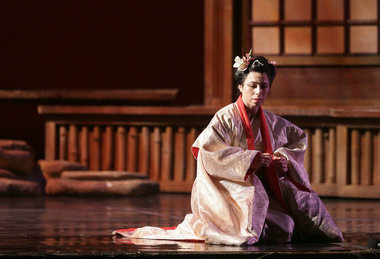 "As Butterfly, soprano Lina Tetriani, in her Mobile Opera debut, is no weak shrinking violet. She only looks delicate and diminutive. She's a strong, determined presence who becomes increasingly tough as her tragic tale unfolds." Watching her descend into delusion is fascinating. Tetriani is a consummate, complex actress and a sensational singer. Her voice simply soars; particularly during the show-stopping aria "Un Bel Di Vedremo," in which she dreamily visualizes the triumphant return of Pinkerton."